People's Law Office attorney Joey Mogul called for hearings on reparations for victims of police torture. CITY HALL — Two dozen demonstrators sang songs of protest at City Hall on the birthday of Martin Luther King Jr. Thursday to press for reparations for the police torture victims of notorious Cmdr. Jon Burge. 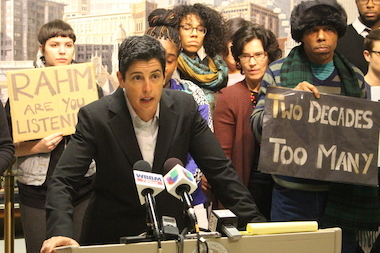 Attorney Joey Mogul, of the People's Law Office and Chicago Torture Justice Memorials, said a reparations ordinance had been introduced over a year ago and had already won the support of 27 aldermen. She called on Ald. Edward Burke (14th), chairman of the Finance Committee, to hold hearings on it and for Mayor Rahm Emanuel to support it. "We will march, we will sing and we will demonstrate until we get a hearing and until the reparations ordinance is passed," Mogul said. 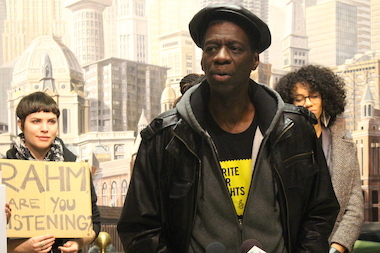 Burge torture victim Darrell Cannon asked for a "measure of justice" through reparations. Protesters sang songs of their own, as well as standards like Pete Seeger's "We Shall Not Be Moved," as covered by Mavis Staples. They also dedicated a rendition of Michael Jackson's "Man in the Mirror" to both Emanuel and Burke. "I'd have to reacquaint myself with the matter," Burke said Thursday after a Finance Committee meeting. "I really don't have an opinion. I'd have to look at it again." He would not commit to holding a hearing on the matter in February, as demanded by the protesters. The ordinance would establish a $20 million fund for victims of police torture over the last 40 years. Although the city has paid $64 million in court settlements to victims of Burge and his "midnight crew," Mogul estimated that more than 110 people were tortured, most of them African-American men, and many had not been able to file suit as the statute of limitations had expired on their cases. The ordinance would also provide victims with medical and psychological treatment, grant them free tuition at the City Colleges of Chicago, establish a public memorial and call for the history of the Burge torture incidents to be taught in Chicago Public Schools. Burge torture survivor Darrell Cannon said the timing was right in that it was a campaign issue in the upcoming municipal election Feb. 24. "Mayor, if you do not stand up and do the right thing, then we the citizens of Chicago will in fact stand up and do the right thing to make sure someone else gets in office," Cannon said. "This may not have happened on your shift, but you are now the caretaker." He called for "a measure of justice." Mogul cited how Emanuel had publicly apologized for the torture, but said that was not enough. "He has failed to do anything to meet the real material needs of the torture survivors and to make amends to them on behalf of the City of Chicago," she added. "We need more than just empty talk. It's time for Mayor Emanuel to walk the walk." Emanuel spokesman Adam Collins replied that the mayor is continuing to negotiate with sponsors of the ordinance to reach a compromise. "As the mayor has said previously, just because the statute of limitations is over doesn't mean our obligations as a city are over," Collins said. He called Burge "a disgrace" and said the Law Department is still working on ways to halt his police pension.